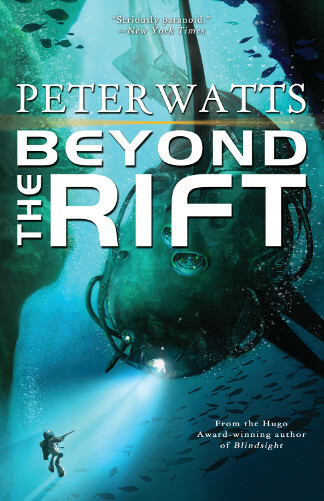 The fine folks at Freelance and Fiction interviewed Peter Watts about hard sf, vampires in space, writing, and of course his new short story collection Beyond the Rift. This has been a pretty good year for collections; my whole short oeuvre up to last year has just come out in Poland (under the title An Antidote for Optimism), and a smaller collection is slotted for later this month in Spain (not sure of the title for that one). But Beyond the Rift is kind of a greatest-hits collection, with a custom-written four-thousand-word essay tacked on at the end. The fiction is pretty consistently science (although some of my stuff has been described as horror, that’s not what I set out to write). The only outright fantasy in the book is a story called “Nimbus”— the second story I ever got published, actually— which is a kind of environmental disaster story built on the premise that clouds are controlled by malign airborne microbes which affect global weather patterns. Check out the rest of the fascinating interview at Freelance and Fiction.